Grilled fig salad with pomegranate molasses and caramelised walnuts. The sweet and salty flavours pair so well in this refreshing salad. It has various textures too which makes it a delight to the palette. Note: for a vegetarian option, omit the prosciutto and scatter extra cheese pieces on top of salad. If you don’t like the taste of blue cheese, substitute it for goat cheese. Choose figs which are firm but a bit ripe.. Soak walnuts in a little bit of water. Wipe figs with a dry paper towel and trim off any excess stem off the top. 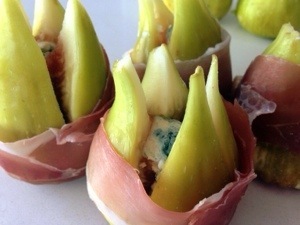 Cut a cross on top of the fig, open gently and place 1 tea-spoon of blue cheese in each fig.Split prosciutto into two, lengthwise and wrap each fig with one part. spilt the leftover prosciutto in half to use later in salad. Remove walnuts and dry quickly. Put sugar with 1 teaspoon water in a fry pan, stir until it bubbles, add honey and walnuts, keep on low heat for a couple of minutes until the walnuts soak up all the liquid and they caramelise. Put aside. Place figs on their side under the grill and grill for about two minutes on each side. 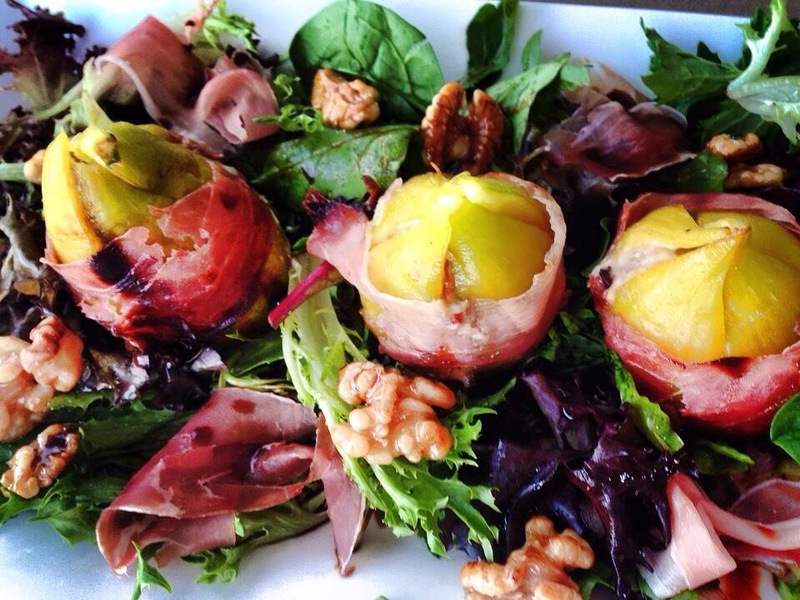 Arrange mixed lettuce on plate, top with figs, scatter the walnuts and leftover prosciutto around the figs. Drizzle pomegranate molasses on top, as well as a little bit of virgin olive oil and cracked pepper to taste. serve immediately. 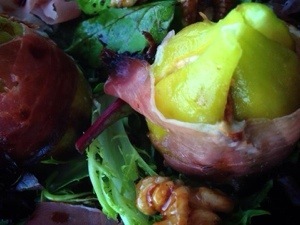 Cut figs in half and place them for a minute under the grill upside down. turn around and top with half a teaspoon of cheese and grill for another minute. Grill the prosciutto under the grill. Follow rest of instructions above. Tags: diet, figs, food, glutenfree, healthy, recipes, salad, salads, starters, vegetarian, walnuts. Bookmark the permalink. Oh God I need this in my life right now why is the grocery store closed? Haha, yes I totally agree, they should stay open 24/7.. Thanks for the comment, it’s great to get feedback. Ugh I’m such a foodie it’s ridiculous. Here’s more feedback: keep posting and all my money’s gonna go to food. 🙂 Did you come up with this yourself or did you find it online and make it and take the lovely photos? Either way, it’s awesome. 🙂 it is actually my own recipe. I’ve tasted something similar in a restaurant years ago, so that’s how I get inspired and start creating my own versions. Other traditional recipes I’ve learnt from some special cooks in my life and then it’s trial and error until I am satisfied and the taste buds are in heaven.